Our latest newsletter: History Center’s 2018 Progress to Date! There’s much to tell you! We’re proud of the progress we’ve made in the first five months of 2018. There’s much to tell you! We’re proud of the progress we’ve made in the first five months of 2018. Moorman, Kizer & Reitzel completed a Boundary and Topographical Survey of the six-acre Arsenal Park. Tom J. Keith & Associates appraised the three houses that will make up the History Center “Village,” and the History Center purchased the house at 831 Arsenal Avenue. In May 2018, our sister organization–the Museum of the Cape Fear Historical Complex Foundation–formally transferred ownership of our current office building, the Culbreth House, to the North Carolina Civil War & Reconstruction History Center Foundation. The staff and board of the Museum of the Cape Fear have been amazing partners throughout our planning process, and we appreciate all their hard work on our behalf. In June 2018, the City is transferring ownership of the Arsenal House and Arsenal Park land to the History Center. 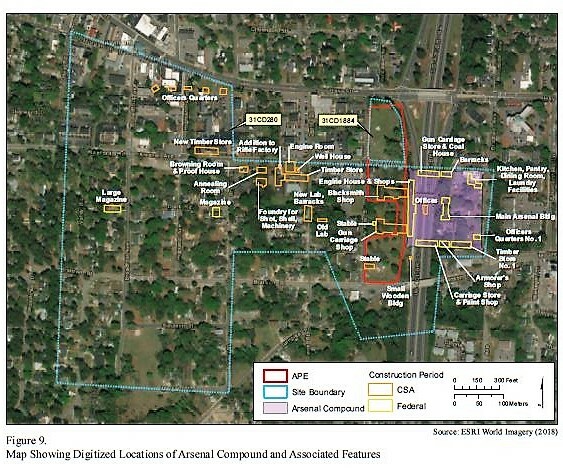 ECS Southeast, LLC conducted an EPA Phase 1 study of Arsenal Park and issued its findings in March 2018. The study concluded that there was no need for further environmental testing. Also in March 2018, New South Associates, Inc. completed its geophysical and archeological survey of the site of the proposed main facility, parking areas, and new site of three historic houses to be located within the History Center Village. Archeologist Shawn Patch presented the company’s findings to the public on April 17th at Highland Presbyterian Church. The fascinating images and captions in the aerial photo below depict the site as it existed in the 19th century. The Honorable Mitch Colvin, Mayor of Fayetteville. … and a link to an editorial in the May 23rd Fayetteville Observer on the History Center, its inclusion in the upcoming budgets of the City* and County*, and information on an upcoming presentation by Hari Jones at Fayetteville State University:http://www.fayobserver.com/news/20180523/our-view-civil-war-center-takes-right-approach. *We’re very grateful to the City of Fayetteville and Cumberland County for their financial commitments! When you see members of the City Council, Board of Commissioners, or their administrations, please take a moment to thank them. We couldn’t have reached this point without their support. Below is a flyer for the June 19th (“Juneteenth”) event referenced in the May 23rd editorial above. The public is welcome to attend this free lecture, but please make plans to arrive early! 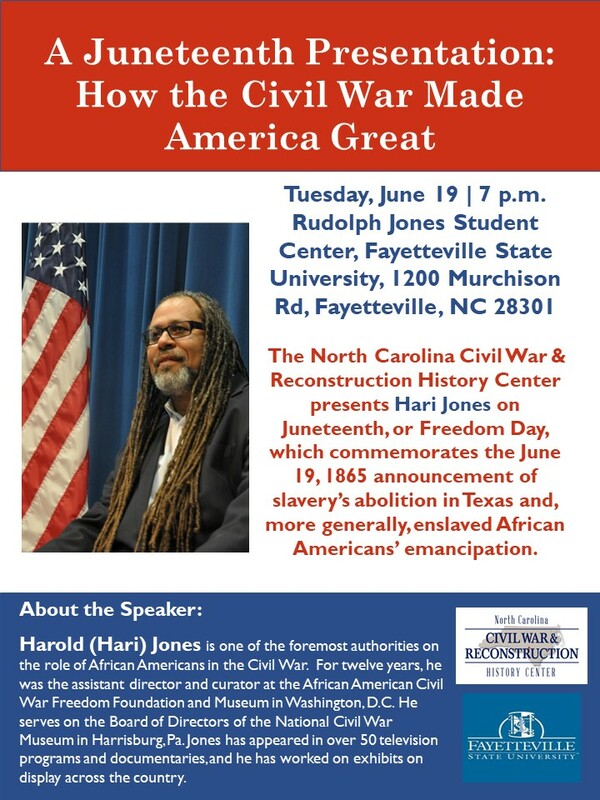 You may remember that Hari Jones’ presentation in October 2012 at the Cape Fear Regional Theatre was standing-room-only for that informative and captivating evening. Thavolia Glymph, professor of History and African-American Studies at Duke University. The results of this seminar will lay the groundwork for the History Center’s digital education component which will be available to North Carolina students–as approved by the North Carolina Department of Public Instruction and the State Superintendent–and will be a critical piece of the Center’s instruction and research knowledge base. Also this summer, we will seek bids for construction and engineering on the three houses that will form the History Center Village. We’re making plans now to move those houses–all 3 in one week!–and expect that to take place this summer as well. We’ll let you know the dates. Afterwards we can begin working toward renovating, upfitting, and equipping the houses for their new uses. In 18 months we expect to be positioned to break ground on the main facility, the 60,000 square foot history center itself! In the meantime, we continue to seek private support from individuals, corporations, and foundations across the state as we work to meet the State’s challenge to raise $2.5 million in cash gifts by June 30, 2019. To become a new member or renew an expiring membership, please visit the Join Page and click button corresponding to the Membership Level you prefer on the page that follows.